Slender Man is a solid B horror movie. There is nothing especially memorable about it, but it’s not terrible either. The problem, however, is that there could have been something great in it. The movie simply was more interested in jump scares than in actual horror. A full confession: some years ago, I became obsessed with the Slender Man Mythos online. I wrote a Slenderblog (as they are called) and even helped create a spin-off mythos. The issue with Slender Man stories, like the issue with all stories, is that 90% of them were crap. I could rattle off all the cliches of the average Slenderblog — and believe me, there were tons of cliches — but there were still a few diamonds in the rough. Slender Man: The Movie is not one of them. If you translated it into blog format, it would be, again, average. Not terrible, but not good either. If this were a few years ago, when the Slender Man was big news, perhaps the movie could have done better, but as a story, it’s super thin. And as a horror story, it’s just...not quite effective. There are a few scares that are good, but they are surrounded by characters that act stupid for the sake of plot and dialogue that alternates between vaguely menacing to just plain stupid. The problem, however, is that I can see where the movie could be great. Just a few tweaks here and there and a few less jump scares and man, this movie could have been a real horror film. For example: until the end of the film, there is no real physical evidence that the Slender Man exists. A week after the four main girls “summon” Slender Man by watching a video, one of the girls disappears. But, then again, her friend states that she talked about running away from home often, since her father was an alcoholic (the alcoholic father is in one of the few actually menacing scenes). So perhaps their friend Katie simply decided to run away. No Slender Man involved. But, since the remaining three girls have convinced themselves that Slender Man was involved, they go out to the woods to perform a ritual that will “bring back” Katie. It’s only in the woods where the girls actually start to see Slender Man. Hey, you know what else is in the woods? Ticks. And ticks can cause lyme disease. And lyme disease can cause fever, headaches, and joint pain. You know where I’m going with this: the girls imagined Slender Man in the woods. They so completely convinced themselves he existed that they caused a form of mass hysteria...and then they all went home with Lyme disease. Which caused the exact symptoms they thought Slender Man caused. There are moments in the movie where I could genuinely see this outcome — moments where one of the characters, Hallie, is walking through a hospital and she slowly starts to hallucinate around her. I could see them hallucinating due to high fevers and giving their fears form. But then the ending comes and it’s just some silly moments where trees grab one of the girls and the other girl goes to the woods to give herself up to Slender Man, but she can’t and then gets tied to a tree. The ambiguity of the situation is completely shattered. There is nothing remotely scary in the ending. But a movie where all of the paranormal aspects are explained away by mass hysteria, feverish hallucinations, Lyme disease, and running away from a drunken parent? Where, at the end of the film, one of the girls has to acknowledge the fact that the thing that tormented them, the thing that caused them to run into the woods, to potentially die of exposure, wasn’t real? That would be much more interesting, much more scary to me. 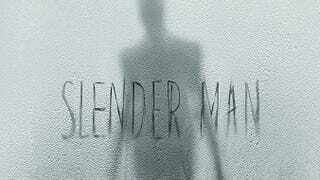 I’m not scared of the Slender Man. I’m much more scared that something in the real world will kill me.